Battlelands Royale is brand new game for Android & iOS by Futureplay. Check out our Battlelands Royale cheats, tips & strategy guide to get #1 rank in this battleroyale game. Also check out Battlelands Royale best landing area, best weapons, and strategy. Futureplay, the creators of one of the best Idle games(Idle Tuber Empire, Idle Farming Empire) has just released a brand new battleroyale game for Android and iOS named “Battlelands Royale”. In Battlelands Royale, you fight against 31 players from all over the world to be the last one on the battlefield. However, it would not be easy as you are playing against real players and everyone has the same goal. As of now, the game features only one mode; solo and lots of cute characters. In this post, we have covered everything about the game you need to know: Battlelands Royale guide and Battlelands Royale tips, cheats & strategy to be the last one(#1) on the battlefield. Before we dive into the cheats, tips & strategy guide part, let’s learn the basic cheat of the game. 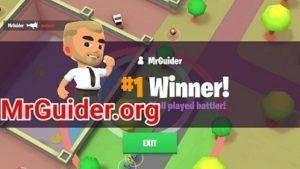 If you have ever played other battleroyale games like PUBG, Fornite, Rules of Survival, Project Battle, Zombsroyale.io, and more, then it would be easy for you to master the game. The Basic Cheat -> It’s not a shooting game. So, it would be better if you keep your shooting skills in the pocket. Your objective is to be the last one on the battleground -> it does not matter how many players you have killed. In the first few minutes, your objective is to find the best weapon(check out the list of best weapons in Battlelands Royale game below) and obtain the shield. Next, in last moments(duel-on crossing), when you and only one player are on the battlefield; now you have to show your shooting skills; if you have the best weapon, then you can easily strike down the enemy. So, this is the basic of Battlelands Royale game. Now, let’s start the Battlelands Royale guide and after it, check out the Battlelands Royale cheats, tips & strategy guide. As of now, there are two control options; locked & follow. It would be better if you set it to follow. Go to the settings -> control -> switch. In Battlelands Royale, the very first step is choosing a perfect landing spot. Then look for the loot; ammo, shield, best guns. At the top-right corner, there is a mini-map. After a certain amount of time, the safe zone will start shrinking. You should be in the circle(Safe Zone) – look at the mini-map. Just keep yourself alive until the end and beat your rivals by using our cheats, tips & strategy guide(below). Before the battle, the player has to choose a landing spot. It is one of the important steps in this game; for example; if you choose a crowdy area, then there are high chances of enemies encounters. And to survive for a long time, you should avoid these encounters. So, it would be better to choose the best landing spot; less crowdy & better loot; guns, ammo, shield, medi-packs. There are a number of popular places where you will definitely get the best loot; maze, hospital, and construction area. But, you should not land there because these areas are very crowdy. 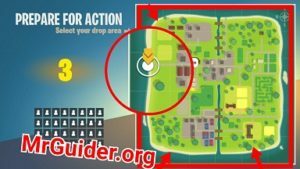 So, what are the best landing spots in Battlelands Royale game? Using Bazooka, you can easily slay down the enemy. But due to poor amount of ammo, you should use it effectively. Mini-Gun is another one of the best guns in Battlelands Royale game. The fire rate is awesome. The amount of ammo is also good. But hit points(damage) are not too good. You can get it from the supply drop. Since bazooka and mini-gun can be obtained only from the supply drop, you should look for the rifle on the battlefield. For more info, open the game -> stats -> head to the weapons tab. Bottom Line -> Look for the rifle & sniper. And try to grab the supply drop for premium guns; mini-gun & bazooka. Well, it is not easy to collect the supply drop because this supply drop attracts a number of players and increases the chances of encounters. But for bazooka or mini-gun, you should go for it. To survive for a long time in this battleroyale game, you should keep yourself at the edge of the safe zone. You can also cover yourself on the grassy field; other players can not see you if you are covered with grass. As stated above, Battelands Royale is not a shooting game. If you are searching for the players on the battlefield to increase the number of kills; then you should avoid this activity. After collecting the loot or best weapon, move to the safe zone silently and cover yourself with grass. Fewer encounters = Long Survival! Usually, the duel ends on the crossing(bridge). If you have a good weapon in your hand; then you are all set. Just stay at a point and analyze the enemy movements; it’s the time when you have to show your shooting skill; dodge enemy shots & shoot accurately.